TSPSC has released the Lab Assistants, Supervisors, Plant Operators and Other Posts Preliminary Answer keys 2018 on commission's website. Candidates who were appeared for this recruitment can download their Preliminary Answer keys and bring to the examination. Preliminary keys for Assistant Dairy Manager / Manager Gr-II and Assistant Quality Control Officer - Notification no.22/2018, Field Supervisor and Processing Supervisor - Notification no.23/2018, Lab Assistant - Notification no.24/2018, Boiler Operator Gr-II - Notification no.25/2018, Plant Operator - Notification no.26/2018, Marketing Assistant - Notification no.27/2018 AND Supervisor (Marketing) - Notification no.28/2018. TSPSC has released the Lab Assistants, Supervisors, Plant Operators and Other Posts Hall tickets 2018 on commission's website. Candidates who were applied for this recruitment can download their hall tickets and bring to the examination. Step 4: In this hall ticket page, Click on the link of "Hallticket Download for Notification No's from 19/2018 to 28/2018 (Lab Assistants, Supervisors, Plant Operators and Other Posts )". 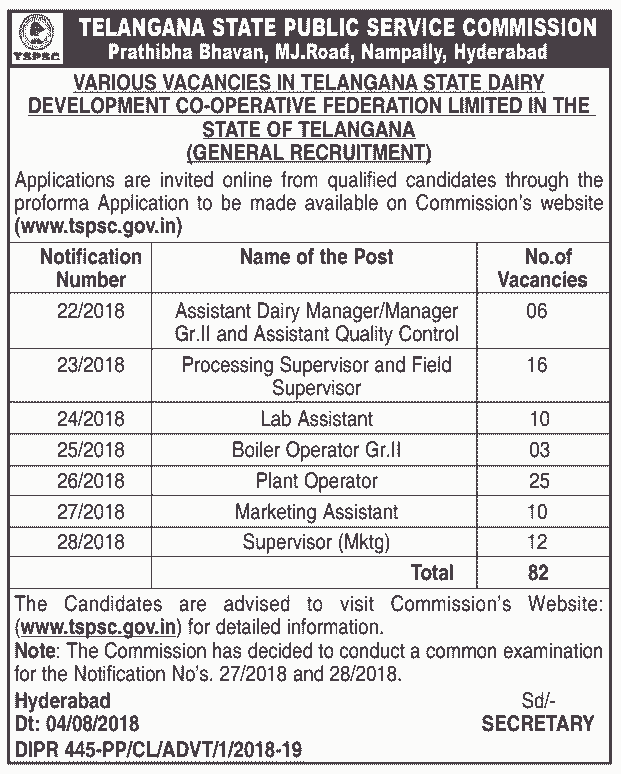 Telangana State Public Service Commission, Hyderabad invites applications for the post of Assistant Dairy Manager/ Manager Gr-II and Assistant Quality Control Officer in Telangana State Dairy Development Co-Operative Federation Limited. Qualification: Degree holder in B. Sc(DT)/ B.Tech (Dairying)/ B.V.Sc & AH or M.Sc Dairy Science. Age as on 01.07.2018: 18 to 44 years. Selection: Based on Written Examination, certificates verification. Submission of online applications from: 08.08.2018. Last date for submission of online applications: 07.09.2018. Telangana State Public Service Commission, Hyderabad invites applications for the post of Field Supervisor and Processing Supervisor in Telangana State Dairy Development Co-Operative Federation Limited. Qualification: Graduation with PG Diploma in Dairy Technology. Qualification: Should have passed IDD of two years duration or must be a Degree holder in B.Sc (DT)/ B.Tech (Dairying)/ B.VSc & AH or M.Sc Dairy Science. Telangana State Public Service Commission, Hyderabad invites applications for the post of Lab Assistant in Telangana State Dairy Development Co-Operative Federation Limited. Qualification: Must possess B.Sc. with Chemistry. Selection: Based on Written Examination, verification of certificates. 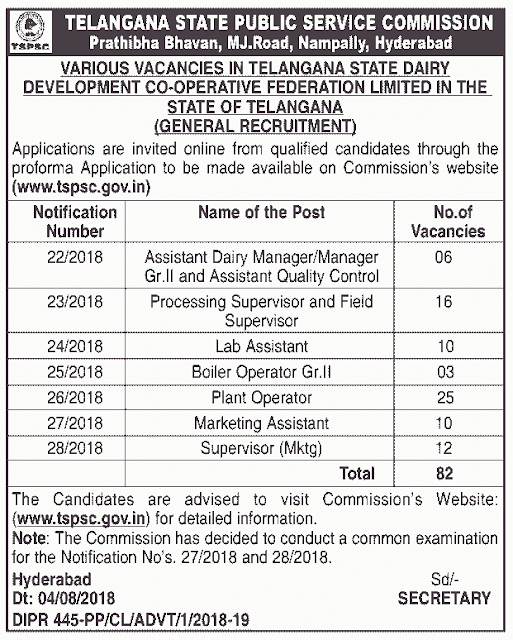 Telangana State Public Service Commission, Hyderabad invites applications for the post of Boiler Operator Gr-II in Telangana State Dairy Development Co-Operative Federation Limited. Qualification: Must Possess SSC with IInd class Boiler Certificate issued by the State Government Competent Authority. Submission of online applications from: 10.08.2018. Last date for submission of online applications: 09.09.2018. Telangana State Public Service Commission, Hyderabad invites applications for the post of Plant Operator in Telangana State Dairy Development Co-Operative Federation Limited. Qualification: Must Possess SSC with Trade Certificate from ITI in Mechanical or Fitter issued by State Government Competent Authority. Telangana State Public Service Commission, Hyderabad invites applications for the post of Marketing Assistant in Telangana State Dairy Development Co-Operative Federation Limited. Qualification: Graduation with P.G.Diploma in Marketing. Telangana State Public Service Commission, Hyderabad invites applications for the post of Supervisor (Marketing) in Telangana State Dairy Development Co-Operative Federation Limited. The Candidates are advised to visit Commission's Website: (www.tspsc.gov.in) for detailed information. Note: The Commission has decided to conduct a common examination for the Notification No's. 27/2018 and 28/2018. TSPSC would conduct the recruitment exams of above mentioned posts from December 12 to 17. For various posts recruitment exam schedule use the below link..